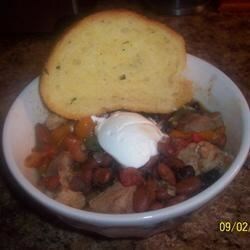 "This is a great chili recipe for your slow cooker. It allows you to spice it up as hot as you can take it. Oh, and let's not forget the garlic, eh!" In a large skillet over medium heat, brown ground beef together with onion, crushed red pepper, garlic powder, and seasoned pepper. Drain off the fat, and place the mixture into a slow cooker. Stir mushrooms, baked beans, kidney beans with liquid, tomato paste, sugar, carrots, celery, peppers, beer, and barbeque sauce into the slow cooker. Season with hot sauce and more crushed red pepper. Cover, and cook on Low for 4 to 5 hours. Super spicy-good chili made with real beer! We had a chili cook-off at work and I made your chili, it was great and I won first prise. Wow! I got a got of great conplements on the chili and many ask for the recipe. Thank you! This was by far the best chili recipie I've ever found! It was great initially, but it was worlds better the following day! I added a habenero pepper as well. Won 3rd place in the work Chili cook-off.